Individuals with missing teeth or slipping dentures can now regain a natural smile and reliable denture that functions, looks and feels magnificent. 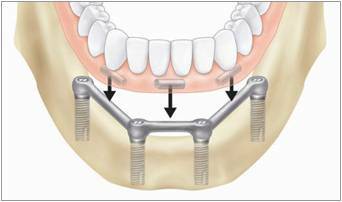 A removable prosthesis is connected to 4-6 implants (upper jaw) or 2-4 implants (lower jaw) by a bar or clip. You can take it out of your mouth for cleaning. Since the bone in the upper jaw is not as hard as in the lower jaw, a larger number of implants may be needed. 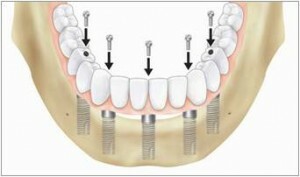 A fixed prosthesis is usually supported by 5 or more implants. 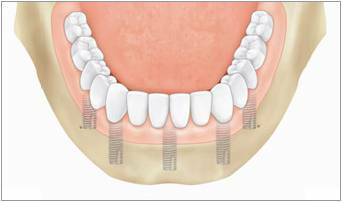 The teeth are fitted to a frame that is attached to the implants by screws or clasps. As this permanent denture does not touch your gums with proper technique you can clean under it. It can only be removed by your dentist. During the first year after your new prosthesis has been placed on the implants, it is necessary for Dr. Bauer to confirm that it fits well and works satisfactorily. Regular checkup appointments will usually be scheduled at 1-, 3-, and 6-month intervals in the first year. At these checkups, dental x-rays may be taken to examine the implant-bone relationship and rule out any disease. After the first year, follow-up examinations are usually necessary only once a year. 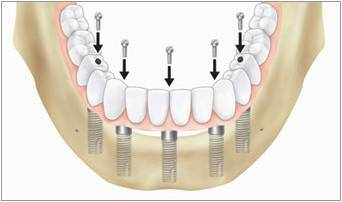 CONTACT US today to set up an appointment and reserve your dental implant consultation with Dr. Bauer and get her opinion on your need for prosthesis.